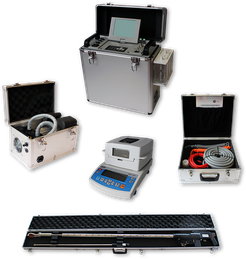 Devices used for the continuous dust measurement register in the wider sense the physical changes caused by the particles in the measuring system converting them into electrical signals. 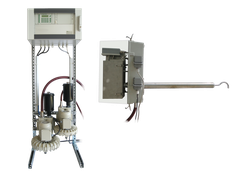 For that the measured object can be analysed directly in exhaust gas channel (in-situ measurement) or a partial volume flow is collected and fed into a measuring device (extractive sampling). As result of the in-situ techniques, the measurement signals derive from the direct interaction of light or a triboelectric probe with the dust particles in the exhaust gas channel. For evaluation the scattered light or the absorbance of a transmitted light beam respectively triboelectricity can be used. 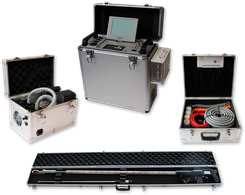 The in-situ measuring devices are only suitable for the measurement of dust in dry gases. In case of wet or saturated with water vapour gases, the existing water droplets and aerosols create also light scattering effects, which distort the measurements results. Therefore in these cases the extractive measurement technique should be selected. The basis of the extractive methods constructs a preferably isokinetic partial flow extraction from the main gas flow. As measuring principles the scattered light measurement or the triboelectric measurement can be carried out. The process-related restrictions have substantial influence over the choice of the measurement method. 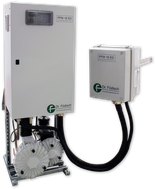 Periodic dust concentration measurements are usually used as a standard reference method (gravimetric) for calibration of continuous dust concentration measuring devices. patented world innovation: sampling and weighting in one system on location!